There are many differences between these two sausages. Chorizo is a type of sausage with origins in the Iberian Peninsula, which is now Spain and Portugal. It is common in its many versions across most of Latin America, including Spanish and Mexican varieties. Spanish chorizo and Mexican chorizo share a name, and both are sausages, but that’s where the big similarities end. There are actually many differences between the two, from what it is made of to how it is used to its history, even how the word "chorizo" is pronounced. Chorizo is usually made from pork or beef, though chicken versions exist, as do more exotic renditions made from meats such as iguana or ostrich. As happens with many other charcuterie or “lunch meat” products, chorizo often includes parts of the animal that would not otherwise be used, because of their appearance or texture. Both the Mexican and Iberian versions of this sausage are made in a myriad of regional and cultural varieties, as well as in a range of quality levels, in their respective countries. Spanish chorizo is commonly made more often of pork, though beef is not unusual. It ingredients usually include smoked paprika, herbs, garlic, and white wine. The mix is stuffed into natural or artificial casings and formed into links that can be short to quite a long length. The sausage is then fermented and slowly smoked; the smoking helps preserve the meat and contributes greatly to the product’s flavor. The chorizo is then air cured for several, if not many, weeks. Mexican chorizo is almost always made with ground fresh, raw pork. Additional pork fat is often added to the meat, and the mix also contains herbs and/or spices, chile peppers (for both flavor and color), and vinegar. The finished product is usually stuffed into short links in edible or inedible casings and “aged” by air-drying for anywhere from one day to a week. Because the chorizos have been made differently, they are prepared differently before serving. 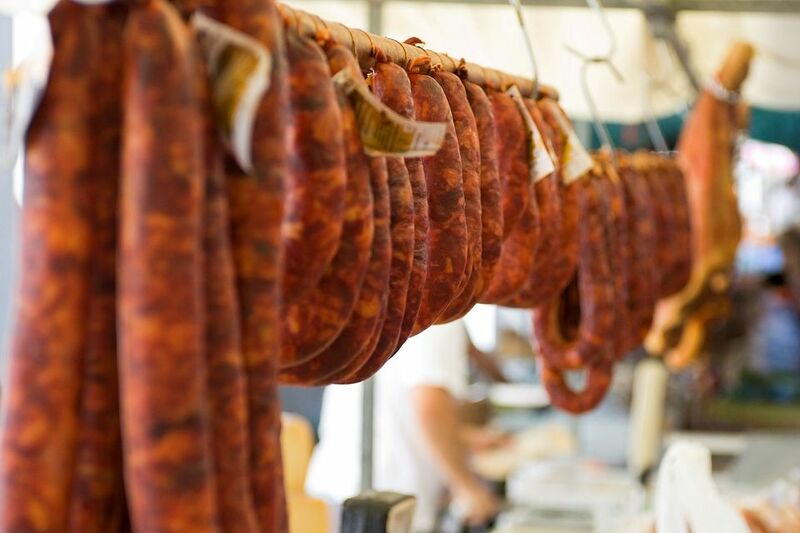 Spanish and Portuguese chorizo, having been cured or smoked, does not need to be cooked before consumption. Many varieties have a texture that is perfect for slicing and eating as a snack or appetizer (as in “tapas”). Softer, fattier kinds of Iberian sausage are perfect for adding flavor and texture to soups, stews, and other cooked dishes. Mexican chorizo, on the other hand, must be cooked before eating. Its soft texture generally precludes it from being sliced or eaten with the casing on, so this sausage is taken out of its casing—if it was even packaged into one—and fried before consuming or using in another recipe. This is often done in a skillet, separating the chunks with a fork or other utensil so that all the meat is evenly cooked and its ground-up character is apparent. Any excess grease is poured off before the meat is eaten. This grasa de chorizo is often used for other purposes, similar to how bacon grease is prized for seasoning other dishes. Even cooked chorizo is rarely eaten as is; its strong, spicy flavor makes it a great element for combining (in relatively small quantities) with other ingredients. Chorizo with scrambled eggs is a common example, as is refried beans flavored with the sausage. Neither type of modern-day chorizo could have existed without the encounter between Europe and the New World in the decades after 1492. Pork has been a fundamental foodstuff in the Iberian Peninsula for many centuries, and curing meat in order to preserve it was developed out of necessity—but the modern version of chorizo sausages was not possible until the “discovery” of the Americas. One of Spanish chorizo’s most common ingredients, paprika or pimentón, is actually a variety of dried and powdered chile pepper, and these peppers originated in the New World. This pepper, then, crucial to both the flavor and color of chorizo today, was brought back to Spain by early conquistadors and traders. Chorizo did not exist in what is now Mexico before the Conquest. Legend has it that the conquistador Hernan Cortes was the one who started the first pig farming operation (in Central Mexico’s Toluca Valley, a chorizo-making center to this day). What is definitely true is that domestic pigs—as well as cattle, sheep, and goats—were brought to the Americas by the Spaniards. The availability of many different types of peppers for seasoning and the use of vinegar instead of white wine (which was generally unavailable) shaped the development of today’s Mexican chorizo. Today, the Mexican variety is made all over the country, though the area around Toluca (capital city of Mexico State) is the region most renowned for sausage making and, in recent decades, the development of chorizo verde, a green-colored sausage that owes its color to the inclusion of cilantro, tomatillos, and/or green chiles.